Thomas Hession began his career at G. Finkenbeiner Inc in 1979 at the age of 15, when he worked here part time after school. He attended Waltham Vocational High School where he studied metal fabrication. This paved the way for his apprenticeship in glassblowing. 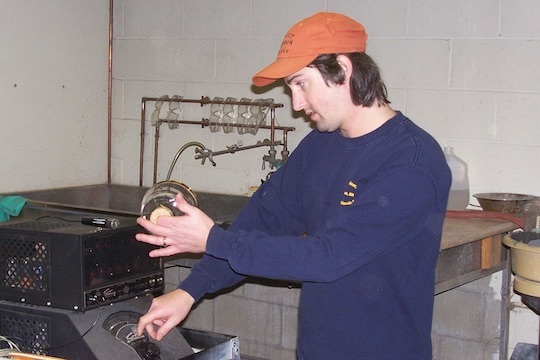 Through his work study program, Tom was hired to clean the shop, stock glass, and ship packages, working under the supervision of master glass blower Frank Ducharme. At age 17 Tom began his full time apprenticeship under Peter Hawkett. He was responsible for the fabrication of quartz wafer carriers for the developing semiconductor industry. In 1987, Mr Hawkett returned to his native England, and Tom’s responsibilities increased to include all quartz fabrication, including plasma semiconductor chambers. He also began working directly under Gerhard Finkenbeiner at this time, and was promoted to Vice President. Working under Gerhard provided many milestone achievements including work on assembling the first glass harmonica made in over one hundred years. Over the span of his career, Tom has been involved in every major operation of the company and continues to set the standard of glass production here today. Tom and Diane took over as owners of G.Finkenbeiner Inc in August of 2007. Diane Hession graduated from Bradford High School in 1984 in Kenosha, WI. After Graduation, she came to New England in search of better opportunities. Diane started working at G. Finkenbeiner, Inc. in 1986 part time doing shipping, receiving and cleaning. Much like Tom, she was unaware at the time of the impact this decision would have on her life. Tom and Diane Hession were married on 2-27-87. Diane came on full time after the office manager position opened up. 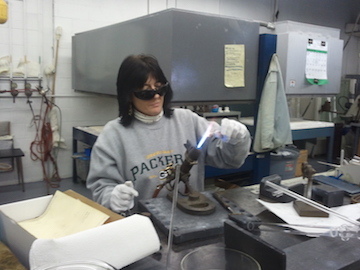 Over the years employed at G. Finkenbeiner, Inc, her duties cover glass harmonica assembling, running the office, shipping and receiving and helping Tom in the shop where she can. Shaun Conroy is a year 2000 graduate of Mass College of Art. 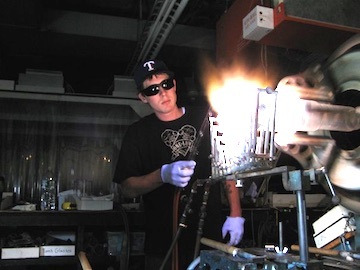 He started here immediately after graduation, making Glass Armonicas and working in the glassblowing shop. Shaun has cut back to part time at G. Finkenbeiner, Inc. He solely works on the Glass Armonica production. 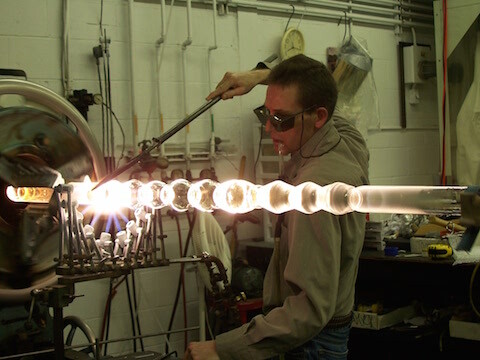 Thomas & Diane's eldest son, TJ has decided to try his hands at glassblowing. TJ is a 2006 graduate of Keefe Tech vocational school in Framingham. He has a background in carpentry. Working in a family owned business has enabled TJ to expand further on all of his hands on skills. When he is not doing carpentry full time, he is here helping out with odd jobs, including basic jobs such as cleaning, local deliveries and shipping and receiving and other more complex including plumbing, flooring and light maintenance. Jaymie is an excellent addition to our office staff. She helps with the glass harmonica, some basic glass cutting, shipping and cleaning. 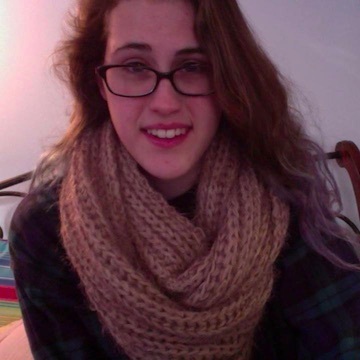 A graduate of Hopkinton High school in 2013, Jaymie took a gap year and backpacked through Europe with a close friend. She currently attends Framingham State University and will transfer to UMass Amherst in the fall of 2015 to pursue a pre vet major. She works some hours during school breaks and the summertime. When she is not working part time or in school or volunteering at Hopkinton Baypath Humane Society, Jaymie is planning her next European trip!